On Monday, March 11 2019, the Honorable David Onley former Lieutenant Governor of Ontario, slammed the Province of Ontario for failing to reach accessibility goals. He noted that unnecessary barriers persist in the built environment, and called on architecture schools, and the profession, to take action. We know that accessibility in the built environment is important to creating an equitable society. Creating places so that everyone can participate equally in social life, business and healthcare shouldn’t depend on needing to find someone with a key to operate special lift; use a backdoor while all your friends go in the front door; or wait for hours to call special transit services to get you to a doctor’s appointment. There is no reason to not make spaces accessible, and inclusive. This is especially true when we consider the effort, and cost, of new construction and see the failures that result when we fail to plan. Some of this is institutionalized and needs to change. There is no reason we can’t have an on-line booking system for paratranspo that would let people book rides, days or weeks in advance. The only thing stopping us from creating this sort of equity is the political will to create change, and budget for it. I’m not a politician, so I’m not in a position to do anything about this, other than advocate for change. But as an architect, I can affect design. When we create a building, we have to decide if we want to meet the minimum requirements of the building code (and which code, more on this), and if that is good enough. Creating a more equitable design that exceeds the minimum code requirements might be a better choice; it might open more doors (literally) to allow everyone to participate. The same can be said of other parts of the built environment. When a street is reconstructed, we spend millions of dollars in hidden infrastructure, and months, if not years, in planning. But we fail to think about the details that affect people in their everyday life. 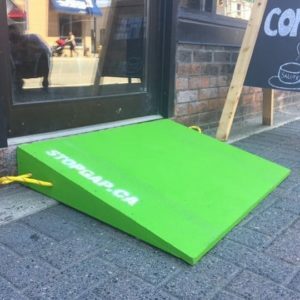 Wherever a Stop Gap ramp is built, you can bet that a small change in design could have lifted the sidewalk to match the door sill, and eliminated the need for an afterthought ramp (don’t get me wrong, I love that Stop Gap exists, but aspire to a world where we don’t need them). We need think about the use of interlock pavers and how accessible they are, especially after a few seasons of winter weather, when they are broken, uneven and a hazard to everyone. We need to think about where we can design snow storage, and how we’ll clear the snow and ice from walkways. This isn’t just for those using wheelchairs, but also parents in strollers; folks using a cane or crutches; or someone who’s a little unsteady and worried about falling. This affects all of us. And all of it can be designed. When we embark on any project, we have to think about how we can create something better than before. Where is the sense in spending millions to redo sewers, a once in a generation project, if the end result of new sidewalks isn’t any more accessible than before? Taking a walk around our office neighbourhood, its easy to see the result. The step is about 100mm (4 inches) above the sidewalk. Had the sidewalk been raised to meet that, we wouldn’t need a ramp to stick out. Yes, this would mean some work to the wood trim of the building to help it not be buried but, again, this is something that can be designed. At the least the sidewalks are wide. There are examples like this on Bank Street, through the Glebe, also. However here, the sidewalks are narrower than Wellington West: I was there last weekend and with the remnants of snow and ice, garbage cans, posts, bike racks and other “urban street furniture” you have walk single file. Passing through here in a wheelchair would be impossible, and there is no room for StopGap to provide ramps. So much for a romantic stroll, hand in hand, through one of the best shopping districts in the city. In short, we need to create places for people, not parking. A short note on building codes: the Ontario Building Code deals (mainly) with buildings (there are some references to exterior elements like walkways leading to buildings). AODA guidelines include exterior walkways, drive aisles and the like and have been adopted into the City of Ottawa Accessible Design Guidelines. The National Building Code also has accessible design requirements, similar to (but slightly different from) the Ontario Building Code. The Department of Defence has their own standard, again, slightly different. Federal projects have to follow the Treasury Board standard for accessibility, which is generally codified under CAN/CSA Standard B651. All of these are generally the same, but specifically different. For example, grab bars in washrooms are different in different standards. Neither is better, or stricter, they are just different. Those differences can make it confusing to the public, and set up overlapping jurisdictions and challenges in permitting.